Underground Coffee Roasters Revolution blend is a coffee revolutionary. Its rich flavours and aromas evoke a spirit of rebellion that has always been a part of the history of coffee. Without this rebellious spirit coffee would not have become one of the most traded commodity in the world. It's estimated that over 500 billion cups of coffee are drunk a year and many millions of people are dependent on the coffee trade for their livelihood. However, this was not always so, there were times when leaders and nations tried to prohibit trade in coffee or shut down coffee houses. Over a century before coffee was discovered in Europe, coffee was a popular drink in Yemen/Arabia, where it was possibly the first country to cultivate the 'arabica' coffee we know today. Coffee had a better rap than alcohol, which was generally prohibited by the government and it also perked up worshippers for late night prayer vigils. In 1511 however, Khair Beg, the governor of Mecca tried to prohibit coffee too by closing down Mecca's coffee houses, apparently because satirical verses were being written about him in these houses, so he blamed the coffee. His superior the Sultan of Cairo reversed the order as he was an fervent coffee drinker himself. 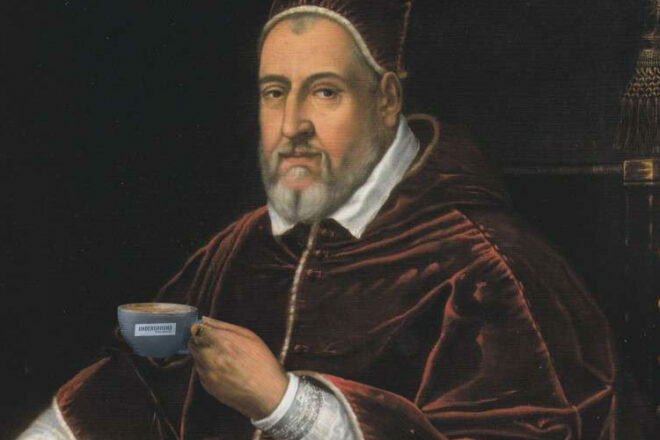 When coffee was making inroads in Europe, Pope Clement VIII's advisors wanted him to ban coffee because it was the 'Devil's Drink' (or because it was popular with the Ottoman Empire), but the Pope tried it and found it so delicious he decided to baptise it instead. King Charles II had his feelings hurt… but Frederick the Great mixed it up a little. In 1777 Frederick the Great temporarily banned it from Prussia, even though he was still enjoying it himself, often mixing it with champagne. Say what!? Since the 16th century coffee has gained popularity with many civilisations and found favour with a series of monarchs and rulers who celebrated the drink, as well as with writers and philosophers, for example, Balzac, who apparently drank 40 cups a day to fuel his nighttime writing sprees. During the French Revolution, there was many cafes that were meeting places for those who later became known as the revolutionaries, such as the Café de Foy where Camille Desmoulin's call to arms inspired the Storming of the Bastille in Paris. The Boston Tea Party in 1773 – where the Sons of Liberty, protesting high taxes on tea imports, sabotaged a large tea shipment and threw it into the Boston harbour – inspired the American Revolution and also America's love of coffee, since this became the beverage of choice to symbolise the new independent spirit opposing British rule. Another revolutionary act was when Baba Budan, a 16th century Sufi smuggled raw coffee beans from Yemen to introduce the crop to India, at a time when coffee was only available from the Yemeni monopoly in a roasted form so the seed was rendered sterile. This was a major step towards making coffee more democratic and affordable to the masses - before this only royalty or the uber-rich could afford Mocha beans (from Mocha on the Red Sea coast of Yemen). It could be argued that the first revolutionary act is told in the Ethiopian legend of Kaldi the goat-herder and his discovery of coffee. According to the legend, Kaldi's goats were the first to eat the coffee bean, making them frisky and disobedient and they would not come when he called. Kaldi witnessed the invigorating effects of coffee on his goats, gave it a try himself and eventually convinced the Ethiopian monks that they could worship all night with the aid of coffee, and this is reputed to be where coffee the drink was invented. Without this brazen curiosity the coffee bean may have still been undiscovered today and the whole rich culture around it would never have been and history might have been quite different… Follow your curiosity and buy some revolutionary coffee today and fuel your inner rebel!